Eltronicschool. - This is one of the best book for you who want to learn more about Robotic field using Arduino in this time. This book titled with Robotics with the BOE Shield for Arduino and written by Andy Lindsay. In this time, beside we will give you global description and table content of this book, we also will give you the link to take free download e-book of Robotics with the BOE Shield for Arduino by Andy Lindsay from external server. 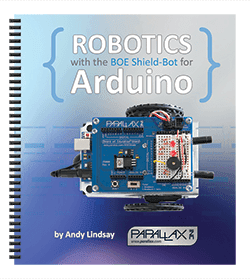 From Free-Engineering-Book site describe that Robotics with the BOE Shield for Arduino book is the print version of the web tutorial on the Parallax Learn site. It is for use with the Parallax Robot Shield with Arduino Uno. The example code is available for download from the web tutorial, and is also ready to use online in the Shield-Bot account of the Codebender web-based editor. And now you can click the link below to take free download e-book of Robotics with the BOE Shield for Arduino by Andy Lindsay from external server easily.